Definition at line 27 of file CLGlobalRenderInformation.h. Definition at line 22 of file CLGlobalRenderInformation.cpp. References CKeyFactory::add(), CCopasiRootContainer::getKeyFactory(), and CLRenderInformationBase::mKey. Definition at line 31 of file CLGlobalRenderInformation.cpp. Definition at line 41 of file CLGlobalRenderInformation.cpp. References CKeyFactory::add(), CCopasiVector< T >::add(), CCopasiRootContainer::getKeyFactory(), CLRenderInformationBase::mKey, and mListOfStyles. Definition at line 109 of file CLGlobalRenderInformation.cpp. References CCopasiVector< T >::add(), and mListOfStyles. Definition at line 102 of file CLGlobalRenderInformation.cpp. Returns a pointer to the LitOfStyles object. Definition at line 71 of file CLGlobalRenderInformation.cpp. Returns a pointer to the ListOfStyles object. Definition at line 79 of file CLGlobalRenderInformation.cpp. Returns the number of styles. Definition at line 63 of file CLGlobalRenderInformation.cpp. References mListOfStyles, and CCopasiVector< T >::size(). Referenced by CLRenderResolver::fill_global_maps(), and CCopasiXML::saveGlobalRenderInformation(). Returns a pointer to the style with the given index. If the index is invalid, NULL is returned. Definition at line 88 of file CLGlobalRenderInformation.cpp. 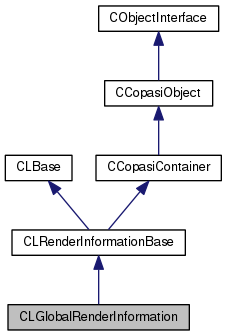 Referenced by CLRenderResolver::fill_global_maps(), CLRenderFlattener::flatten(), CCopasiXML::saveGlobalRenderInformation(), and toSBML(). Definition at line 97 of file CLGlobalRenderInformation.cpp. Definition at line 118 of file CLGlobalRenderInformation.cpp. References CLRenderInformationBase::addSBMLAttributes(), getStyle(), mListOfStyles, and CCopasiVector< T >::size(). Definition at line 30 of file CLGlobalRenderInformation.h. Referenced by addStyle(), CLGlobalRenderInformation(), createStyle(), getListOfStyles(), getNumStyles(), getStyle(), and toSBML().